TreeBaltimore is a mayoral initiative spearheaded by Baltimore City Recreation and Parks. This program strives to increase the urban tree canopy through the establishment, management and preservation of trees. • Fostering a sense of stewardship. 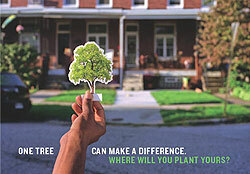 The TreeBaltimore campaign is a “call to action” for residents to plant a tree. By planting and caring for a tree at your home, business or park, you are helping to clean our air and water. Trees also help reduce summer air temperatures, save energy, buffer noise and increase the economic stability of Baltimore. For more information on TreeBaltimore, including updates, activities, events and tree giveaways, visit www.treebaltimore.org.